Users who need a high degree of flexibility and reliability when capturing barcodes need look no further than the wireless QuickScan QM2400 from Datalogic. 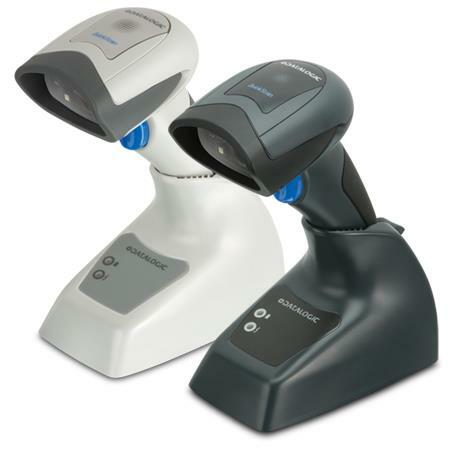 The area imager quickly, securely and reliably captures both 1D barcodes as well as the more commonly used 2D barcodes. This applies to both printed barcodes as well as for digital codes on monitors and smartphone displays. Thus the QM2400 is also excellent for mobile marketing applications in retail. Besides using it at the POS, you may also utilize this mobile scanner optimally in incoming goods, for inventory management, in administration, for postal services and in banks. The large radio range of up to 25 m from the base station increases user efficiency. Users have more freedom of movement and there are no cumbersome cables which could interfere. Particularly workers who do not have a fixed work area benefit tremendously. A particular advantage of Datalogic’s own developed narrow band communication version is that there is no interference with the Wi-Fi infrastructure. The high performing lithium ion batteries ensure for long operating times. The battery – the part most in demand – may be easily exchanged on-site, saving users time and maximizing efficiency. In case of a defect only the affected part needs replacing, which positively reflects in operating costs. In the scanner stand there is an integrated micro USB connection, available to you as an alternative recharging method, making pure cradle charging unnecessary. Datalogic’s patented Green Spot good scan confirmation ensures that the user receives clear feedback after every scan. The characteristic green good read dot lights up on the captured barcode after a successful scan. System errors and loss of time due to double scanning become a thing of the past. The targeting and lighting systems of the QuickScan QM2400 are also user friendly and efficiency-oriented. The dark red lighting goes easy on users’ eyes. Two starkly contrasting blue triangles clearly define the target area, making working with lists more precise.